Thai Soup Recipes for the beginner cook. Thai soup recipes can be complicated and many of the ingredients unfamiliar to American cooks. However, they can be adapted and made simple for the beginner cook. What's great about them is that they are highly nutritious and contain very little meat. Learning how to make a few basic Thai recipes is a great way to eat the low glycemic way and have a lifetime of fat loss! Americans in general eat far more animal protein than Asians. And, significantly, we have far higher rates of heart disease, cancer, and obesity in the west. In his famous China study, the most comprehensive study done on the relationship between nutrition and disease to date, Dr. T. Colin Campbell related that in rural China the average daily intake of protein a day was 7 grams compared to 70 grams in America! For most adult men 50 grams of protein will be enough and it doesn't have to be all animal protein. Most women need about 45 grams of protein. Remember that beans and whole grains combine to make a complete protein. In Thai cooking very little meat is added to a dish. There are a few basics to get right, the seasonings and the basic groups of ingredients. The vegetables most commonly used in Thai soups are kale, celery, cabbage, bok choy, cucumber and sometimes cauliflower. These two recipes our some of our printable low glycemic index recipes. Fry the garlic in a frying pan with the pork and stir until it's done. Strain the oil from the pork and add the sugar and soy sauce and stir. Put it aside. Slice the cabbage in half and then cut it lengthwise on the diagonal. 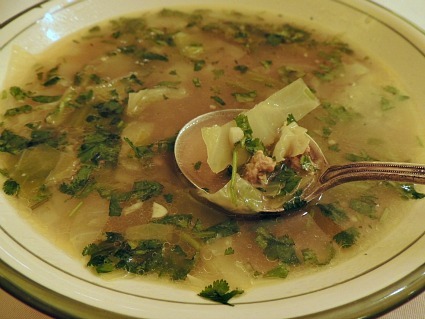 Add the celery and cabbage to the water and chicken broth and bring to a simmer. Cook the soup for 10 minutes and then add the pork and garlic to the soup pot. Add the fish sauce and the cilantro and taste for the flavor. You may wantto add more sweetness or more soy sauce. If it needs more spice add the fish sauce. * If you add more water to the soup you can have lunches for 2 people for 2 or 3 days. If you can't find the lemon grass in your super market look in a specialty market or your natural foods store. Wash, shell, remove the heads and de-vein the prawns. Bring a pot of chicken stock or broth to a boil. Add the lemon grass and cook until fragrant. Add the prawns and mushrooms and cook for 5 minutes. Season with lime juice, chilies and fish sauce. Add the chopped cilantro and turn off the heat. Garnish each bowl with cilantro. Once you have made a pot of soup, you have an evening meal and a few lunches for one or two people. Cook a grain, barley, quinoa or brown rice while your soup is simmering. Here's where a rice cooker becomes an essential tool in your kitchen. It will cook your grain perfectly* and keep it warm for you. When you pour your soup on the grain you have a complete meal. Leftover grain will be perked up by the soup for your lunches. Thai soup recipes will make far more satisfying and healthy lunches than the typical American style sandwich. They are full of fiber and all the complex carbohydrates your body craves. Thai soups are better for your blood sugar, your waistline and your cholesterol levels. * A rice cooker ensures that the rice turns out fluffy and not over cooked. It is an inexpensive and indispensable kitchen tool. Return from Thai Soup Recipes to Lifetime Fat Loss home page. Return from Thai Soup Recipes to Low Glycemic Recipes.